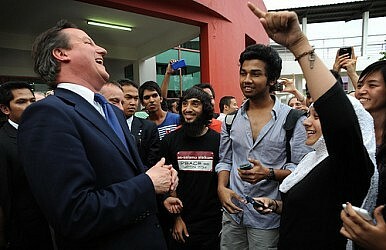 British Prime Minister David Cameron has been in Malaysia. Can he improve ties hurt during the Mahathir era? British Prime Minister David Cameron flew into Kuala Lumpur this week. Significantly, it’s the first visit by a British leader since John Major in 1993, and reflects rapidly improving ties between Kuala Lumpur and the West, achieved largely through the work of Cameron’s counterpart Najib Razak. Under former Prime Minister Mahathir Mohammad, relations had deteriorated to the lowest of possible ebbs, with Malaysia’s longest serving leader always complaining about Western conspiracies designed to bring him down while rivals like Anwar Ibrahim were jailed and bashed. Critics argued Mahathir’s chief objective was to win local votes, although his boasts – justified or not – continued well into retirement, with him more recently mocking Britain for its current financial problems. Najib, however, has reveled on the international stage since coming to power in 2008, and moved to mend much of the unnecessary damage created by his predecessor. This included a European tour last year when he met Britain’s Queen Elizabeth and Pope Benedict XVI. At the Vatican, Najib and the Pope agreed to establish diplomatic ties. Given Malaysia’s Muslim majority status this went a long way to allaying fears over religious injustices. Najib has had to contend with his own firebrands while trying to establish the Global Movement of Moderates (GMM). In 2009, some authorities tried to enforce a ban on Christians using the word “Allah” when referring to God in the Malay language, despite the word having been used in local bibles and dictionaries for centuries. Tensions also escalated amid arson attacks on churches. In the aftermath, pigs heads were left at the entrance to several mosques, but this was widely believed to have been staged by troublemakers hoping to blame Christians. Pig meat is non-halal and the heads had been wrapped in plastic bags, suggesting they were not handled by Christians. At home, Najib has also bowed to popular demand and announced electoral reforms while abandoning the dreaded Internal Securities Act that allowed for detention without trial. He has also backed the West over its stance on Iran and its nuclear program and eschewed the bloodshed in Syria. It’s typical diplomatic speak, glib and hardly the stuff of great speeches. But the hidden reality is that no British leader would have been bothered with Malaysia until Najib decided to put the interests of his country first, and place the country fairly and squarely on the international stage. Most people would welcome that, but it just might make Mahathir a little madder.